Whether you’re doing a casual workout or training for a major sporting event, what you eat and drink is really important. The right nutrition will help you perform at your best and achieve your goals. As well as providing energy to fuel your body during exercise, it will reduce your risk of injury and illness and help you to recover afterwards. So what foods should you eat and when is it best to eat them? We’ve put together some top tips to help support you in your exercise routine or competition. If you’re training regularly for a specific event, speak to a dietitian for advice that’s personalised to you. To help you get the most from your exercise, it’s important to eat a healthy balance of foods rich in nutrients. This includes carbohydrates, protein, healthy fats, fruit and vegetables, and fluids. Click here to download a PDF of this topic. Carbohydrates are your body’s main source of energy. So whatever activity you’re doing, carbohydrates play an important role in helping you perform at your best. Carbohydrates help to regulate your blood glucose (sugar) level. They’re broken down into individual units of sugar during digestion, which are then used by your muscles for movement. Any carbohydrates you don’t use are stored in your muscles and liver as glycogen, ready for the next time you need them. The exact amount of carbohydrate you need to eat will depend on how much energy you need every day, and is unique to you. This takes into account what type of activity you’re doing, whether you’re a man or a woman, your age, and environmental factors like the temperature. Generally, the harder you train, the more carbohydrates you need. 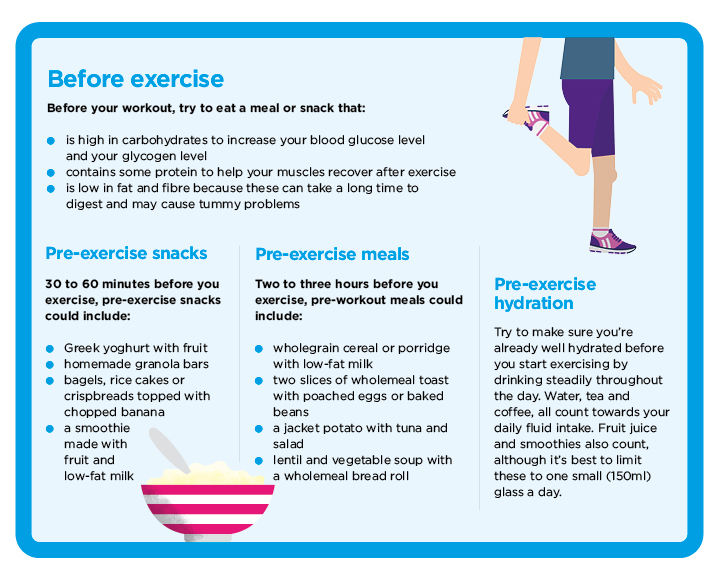 Keep your energy levels topped up by having a low-fat, high-carbohydrate meal or snack 2–3 hours before you exercise. Replenish your glycogen stores after exercise by eating a snack or meal that contains carbohydrate within 30 minutes of finishing your workout. 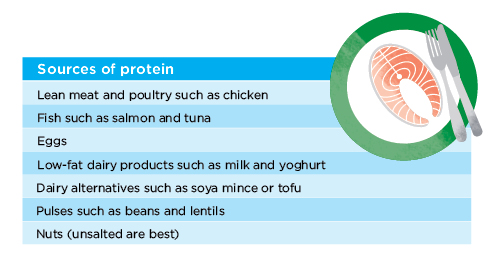 As well as being a source of energy, protein is essential for the growth and repair of your muscles. Eating enough protein will help your body to recover properly after exercise. The exact amount of protein your body needs will depend on the type of activities you do. As with all nutrients, the more exercise you do, the more protein your body is likely to need. Try to eat 2–3 portions of high-quality protein throughout the day. It’s important to remember that the exact amount of energy your body needs is unique to you. So if you’re doing a lot of exercise or are training for a specific event, you might need more of some nutrients. Speak to a dietitian to make sure you’re getting everything your body needs . There are lots of products and supplements such as shakes, powders and bars containing added protein available to buy. But you can usually get the protein your body needs by eating a healthy, balanced diet that includes a variety of protein-rich foods. So taking extra protein supplements isn’t necessary for most people and won’t help you to grow bigger muscles. However, protein supplements can be useful if you’re short on time or don’t have an appetite straight after exercising. They can provide you with the nutrients your body needs to recover if you’re not able to eat your main meal for a few hours. Fat is an important part of a healthy diet. Fats are a valuable source of energy and provide you with vitamins such as A, D, E and K. They also contain essential fatty acids which your body isn’t able to make for itself. As with all foods, eating too much can cause you to gain weight, so it’s important to eat the right types of healthy, unsaturated fats in moderation. Aim to eat less saturated fat. Saturated fats can increase your level of bad LDL cholesterol which is harmful to your health. They’re found in takeaway foods, cakes, biscuits, dairy products like butter and fatty meat products such as red meat and sausages. Opt for unsaturated fats wherever possible because these are healthier choices. Unsaturated fats may be monounsaturated or polyunsaturated. Foods high in monounsaturated fats include avocados, olive oil and nuts such as cashews and almonds. Food high in polyunsaturated fats include oily fish such as fresh tuna, salmon and mackerel as well as nuts like walnuts. Polyunsaturated fats contain essential fatty acids such as omega 3, which can increase your level of good HDL cholesterol and are good for your heart health. Try to eat at least five different portions of fruit and vegetables every day. A portion is roughly 80 grams. For example, one banana, two plums, a handful of grapes, a dessert bowl of salad or three heaped tablespoons of vegetables. Fresh, frozen, tinned and dried varieties, fruit juice, smoothies and pulses all count towards your daily intake of fruit and vegetables. But be sure to limit dried fruit to one heaped tablespoon (30g) and fruit juice and smoothies to one small (150ml) glass per day. Aim to eat a colourful variety of seasonal produce. Whether they’re green, yellow or red, each colour group contains a different combination of vitamins and minerals, so be sure to try them all. Taking vitamin and mineral supplements isn’t usually necessary unless you have specific medical or nutritional needs. For example, if you’re cutting out a certain food group from your diet, or you’re pregnant or over 65. Even if you’re doing a lot of exercise, you should be able to get all the vitamins and minerals your body needs through a healthy, balanced diet that includes plenty of fruit and vegetables. If you have any questions about your personal needs, speak to a dietitian for more information. Keeping an eye on the colour and volume of your urine is a simple way to test how well hydrated you are. The darker it is, the more dehydrated you are. Passing a normal amount of urine can suggest you’re well hydrated, whereas smaller amounts can mean that you’re dehydrated. 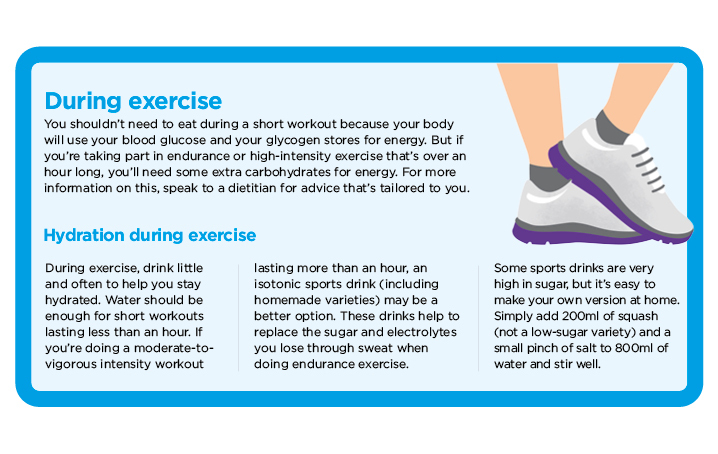 Try these snack, meal and drink ideas to help you get the most out of your exercise routine. Try to make sure you’re already well hydrated before you start exercising by drinking steadily throughout the day. Water, tea and coffee, all count towards your daily fluid intake. Fruit juice and smoothies also count, although it’s best to limit these to one small (150ml) glass a day. Click on the image below to open the PDF (PDF 0.4 MB, opens in a new window). You shouldn’t need to eat during a short workout because your body will use your blood glucose and glycogen stores for energy. But if you’re taking part in endurance or high-intensity exercise that’s over an hour long, you’ll need some extra carbohydrates for energy. For more information on this, speak to a dietitian for advice that’s tailored to you. During exercise, drink little and often to help you stay hydrated. Water should be enough for short workouts lasting less than an hour. If you’re doing a moderate-to-vigorous intensity workout lasting more than an hour, an isotonic sports drink (including homemade varieties) may be a better option. These drinks help to replace the sugar and electrolytes you lose through sweat when doing endurance exercise. Some sports drinks are very high in sugar, but it’s easy to make your own version at home. Simply add 200ml of squash (not a low-sugar variety) and a small pinch of salt to 800ml of water and stir well. Click on the image below to open the PDF (PDF 0.1 MB, opens in a new window). 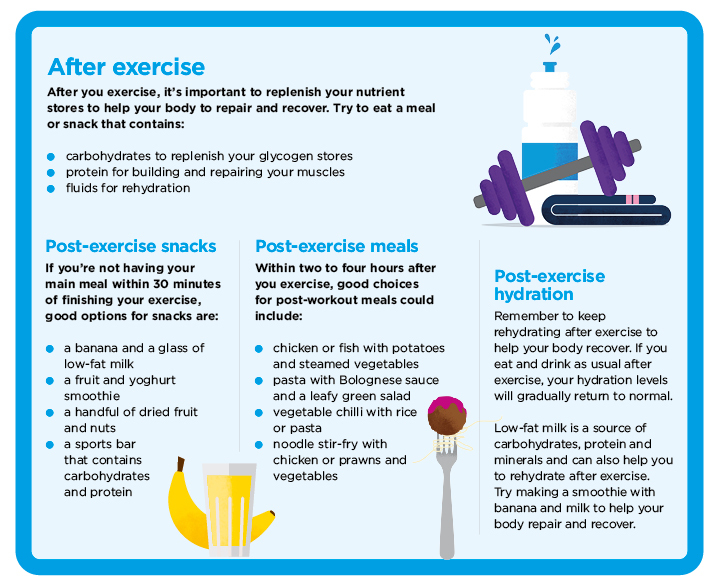 Remember to keep rehydrating after exercise to help your body recover. If you eat and drink as usual after exercise, your hydration levels will gradually return to normal. Low-fat milk is a source of carbohydrates, protein and electrolytes and can also help you to rehydrate after exercise. Try making a smoothie with banana and milk to help your body repair and recover. Click on the image below to open the PDF (PDF 0.6 MB, opens in a new window). Remember that everybody is different, and you might react differently to certain foods or eating at particular times when exercising. It could work best for your body if you eat 3 hours before you exercise to allow enough time for your meal to digest. Or you might prefer to eat a small snack an hour before you start moving. Maybe eating a meal within 30 minutes after exercising doesn’t feel comfortable in your tummy, so drinking a smoothie is a better option for you. If you have an important event or race coming up, make sure you know what suits you and don’t try anything new on race day. Experiment with different foods and timings during your training and see what works best for your body. There are now all sorts of fitness events you can participate in: half marathons, endurance events, or even inflatable obstacle courses. Nutrition for sport and exercise. British Nutrition Foundation. www.nutrition.org.uk, accessed February 2018. Sport. The Association of UK Dietitians. www.bda.uk.com, last reviewed April 2017. The Eatwell Guide Booklet. Public Health England. www.gov.uk, July 2016. Macronutrients and energy balance. Oxford Handbook of Nutrition and Dietetics (2nd ed, online). Oxford Medicine Online. Published January 2012. Carbohydrates. British Nutrition Foundation. www.nutrition.org.uk, accessed February 2018. Carbohydrates. The Association of UK Dietitians. www.bda.uk.com, last reviewed May 2016. Energy intake and expenditure. British Nutrition Foundation. www.nutrition.org.uk, accessed March 2018. Potatoes, bread, rice, pasta and other starchy carbohydrates. British Nutrition Foundation. www.nutrition.org.uk, accessed January 2018. Protein. British Nutrition Foundation. www.nutrition.org.uk, accessed February 2018. Fruit and vegetables. British Nutrition Foundation. www.nutrition.org.uk, accessed March 2018. Fats. The Association of UK Dietitians. www.bda.uk.com, reviewed January 2015. Fat. British Nutrition Foundation. www.nutrition.org.uk, accessed March 2018. Heart Health. The Association of UK Dietitians. www.bda.uk.com, last reviewed July 2017. Fruit and vegetables - how to get five-a-day. The Association of UK Dietitians. www.bda.uk.com, reviewed July 2017. Rodriguez NR, DiMarco NM, et al. Joint position statement: Nutrition and athletic performance. American College of Sports Medicine, American Dietetic Association, and Dietitians of Canada. Medicine and science in sports and exercise 2009; 41(3): 709-731. doi: 10.1249/MSS.0b013e31890eb86. Fluid - (water and drinks). The Association of UK Dietitians. www.bda.uk.com, last reviewed March 2017. Supplements. The Association of UK Dietitians. www.bda.uk.com, last reviewed March 2016. Liquids. British Nutrition Foundation. www.nutrition.org.uk, accessed February 2018. Muscle cramps. The MSD Manuals. www.msdmanuals.com, last full review/revision July 2016. Healthy hydration guide. British Nutrition Foundation. www.nutrition.org.uk, accessed February 2018.